This is a busy time of the year for Silverstream Retreat as we help our happy couples prepare for their big days. We’re often asked by couples what’s trending for the upcoming season year. Wedding trends are always changing, colours, themes, clothes and accessories and in more recent years technology. Over the years we’ve seen the good, the bad and not so good. We’ve decided help out our couples by coming up with a few predicted trends for 2014-2015. Layer and textures are popular for 2014 bridal gowns. Floor length dresses with open back and combinations of soft fabrics (lace, chiffon and organza). Loosely-done waves, super chic bobs are popular styles with flowers, hairpins and fascinators are popular accessories. Most bouquets are hand-tied, with the flowers gathered together and wrapped in wide satin ribbon. The style is looser than previous years, with a ‘just picked’ look. Adding beads and brooches, crystals and feathers seem to be a continuing trend from the last year. The choice of flower will often depend on the season, roses continues to be the most popular bouquet flower, hydrangeas, peonies and orchids are also very popular. 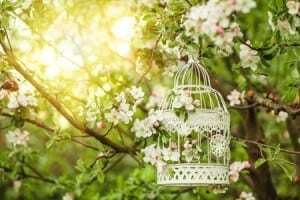 Couples are choosing to decorate their venues with more and more unique items bird cages, crystal trees, vintage furniture and one we really like is photos and portraits used as decorative elements. 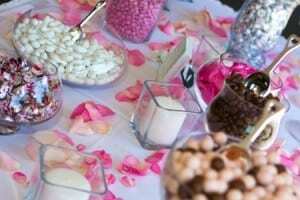 Other popular decorating items include Chinese lanterns, tissue pom poms, garlands and oversized balloons. A popular decorating trend is the confection bar, which is where a variety of lollies or treats are grouped together on a table, in glass jars of varying size. Silver spoons or scoops in each container allows guests to fill small boxes or bags as take-home wedding favours. Couples are sticking to the traditional sponge, chocolate, vanilla or fruit cake, choosing cake decorations that fit with the wedding theme. Couples are choosing photo journalistic style (actions shots of the day’s events) wedding photography over the traditional posed portraits. Posed portraits are still requested with a mix of colour and black and white photos. The most common wedding themes for the up-coming year are rustic, vintage, and garden all with a mix of glitter, glam and tradition.